For more information on how to report a bug (including examples), check the Reporting Bugs and Providing Feedback thread. The Additional Instance Installer does not display text in the chosen game language when selecting the European Region. 1. I opened the installer and selected 'Game Settings' from the installer home page. 2. From the settings menu I chose to "Install Additional Game Instance". 3. The UI loads with my current region (NA) displayed and Game Language choice of English. 4. I change the region to Europe and the UI loads with Spanish as the displayed text. English is still my chosen game language. 5. The link to "Show System Requirements" however is in English. 6. When I select Russia or Asia instances the text is displayed in English. 7. Going back to Europe the text still displays in Spanish. WG, not sure this is a bug or is FAD. The selected Game Language does not persist when changing Region. 4. I change the language to Spanish (Mexico) and the UI loads with Spanish as the displayed text - as expected. 5. The link to "Show System Requirements" remains in English. 6. When I select Russia or Asia regions the Game Language setting and text reverts to English. I may be using this UI in a manner you are not expecting a user to act. My expectation is that those selections should persist independent of each other. Initial UI when Additional Instances is selected. Changed the language to Spanish (Mexico) and the language changes as expected. With language of Spanish (Mexico) selected, I changed Region to Asia (or Russia) and language changed to English. Edited by Khafni, Oct 07 2016 - 22:42. 2. When prompted to import my installed games, I agreed. The program remained stuck at this screen for several minutes until i ended the process via the task manager and restarted the program. 404 error dialog not fully displaying. I selected the Useful Link to see the 0.5.12 Economics: Before and After information. The page that opened in the launcher gave what looks like a 404 error. Only the top part of the 404 could be seen. Scrolling down did not display the full error. I attempted to find this link on the WoWs homepage but it wasn't available. This could be a page availability/timing issue which might need some work syncing them up. Nice touch, BTW. Showing a submarine as the 404 background. Definitely 'not found'! 1. 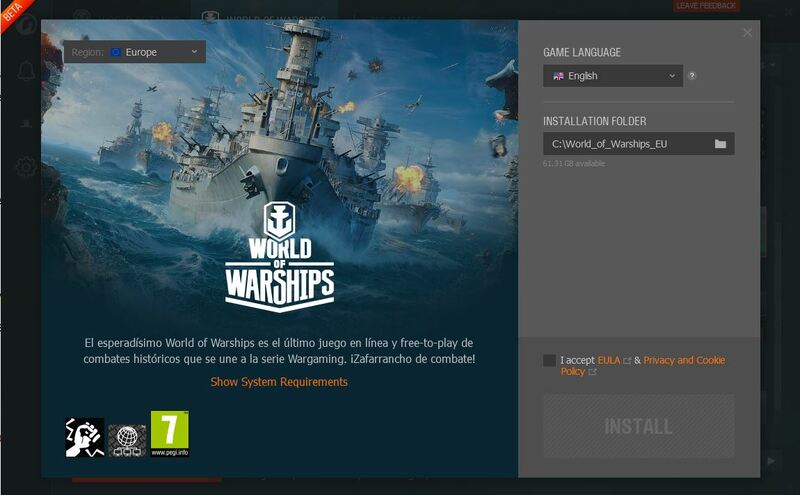 I opened the installer and selected the WoWs NA instance. 2. I selected the '0.5.12 Economics: Before and After' link from the Useful Links section. 3. A supposed '404' dialog partially was displayed. 4. The scroll feature did not bring the whole page into view. 5. Could not find same link on WoWs homepage. Broken link? Edited by Khafni, Oct 08 2016 - 23:28. The first news article to the right, called "Economics: before and after" gets a 404 error. I elected to uninstall Gamecenter to see how that works. Uninstall is not easy to accomplish and is not user friendly. 1. There is no 'Uninstall Gamecenter' shortcut in the Wargaming.net folder. 2. The uninstall error is confusing. Gamecenter will not uninstall with Gamecenter closed (and process is still running). 3. It is not at all clear what the user needs to do if they have closed Gamecenter and still cannot execute the uninstall command. The uninstaller should automatically close the associated processes when the uninstall is initiated or provide better directions to the user. 4. Uninstall left residue - arguably not user files as they are really just log files created by the application. Does the presence of a game folder in the Gamecenter start menu folder indicate an imported game or is that held in the log files? If the log files are not re-used on a reinstall then they should be removed when uninstalled. 5. It also left the Wargaming.net start menu folder but, if Gamecenter is the only source of game installation, then they should remain so the user can access the start game shortcut. 3. I had to find the actual installation directory and click Uninstall. 4. Received an error (screenshot one) that said I had to close the application - which I already accomplished. 5. I opened task manager and found the primary process and stopped it. 6. Then ran uninstall with no problem. 7. Found residue in source directory and start menu. You can actually see the whole error, I, like Khafni, cannot. It won't scroll down so all you see is a Sub. If I hadn't read Khafni's post and was trying to see if it was same for me I wouldn't have known what the issue was. I can only see part of it as well, but if made the WGC larger it would show more. Still not the entire page though. Still not working, still getting the 404 error. However, the article "The ways to pay" seems to be working perfectly. Hmmmn. I'll try to be more descriptive in the future. Thanks! 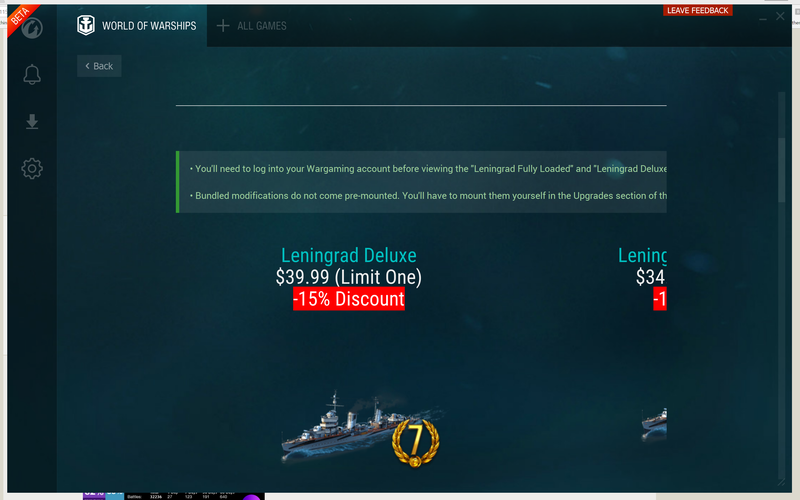 When viewing the article about the Leningrad (WOWS), some of the text does not display, even after enlarging the launcher (taking up more than 3/4 of a 4K display). There is no sidescrolling capability in the launcher. Edited by DanielLeary, Oct 12 2016 - 00:36. Thanks for the update and fixes WG. GameCenter installed its update and I re-tested the bugs I submitted earlier. Here are the results. 1. The bug described in post #2 is resolved. 2. Behavior must function as designed in post #3 as it is still there. 3. I have not encountered any other 404 errors (or any link errors, period) to reproduce post #5. 4. The behavior exhibited in post #7 still exists. This is one of the cleanest ‘beta’ software deliveries I’ve experienced. Great job! Will keep looking but not expecting to find much. I opened the Wargaming.net Game Center Notification UI and notifications from 7 days ago are now displaying where they appeared to have stopped displaying after one day. Not sure if this UI is supposed to scroll or if there are more notifications queued up or not. 1. Open Gamecenter build 0.14.3.15487.1429 (first update patch). 2. Note today's update notification. 3. Also note 5 other notifications dating back to the WoT update on 10/12/2016. 4. The 5 other notifications were gone from the UI a couple of days after installation. Description of the bug: Installing with WINE errors out. This is using the WINE program PlayOnMac. I have successfully installed World of Tanks in PlayOnMac before, and it usually does well with other Windows programs. Steps to take to reproduce the issue: Run the installer file for WGC, starts properly, shows language selection properly, downloads files properly, starts installing okay, but then it crashes with the error message: "Wargaming.net Game Center cannot recover from an error. Please reinstall the application from support center. Contact Support". Unhandled exception: page fault on execute access to 0xc5685301 in 32-bit code (0xc5685301). After running the beta and launching/playing WoT and WoWS every day for the last two weeks, I am now experiencing odd launching behavior for WoT only. I would get this error msg ...then hit cancel....then the error msg would repeat a second time...then hit cancel...the error msg would go away and WoT would continue loading properly. I have repeated this three days in a row..the error msg always repeats twice and then goes away...and the game plays normally. Again, I would like to point out that this only occurs in WoT and only after plays every day for the last two week did it appear three days ago. Happy to provide any other info that is requested or answer any followup questions. Windows 7 Home edition 64 . I use several external drives and wargaming/WoT/WoWs is stored on one of them (not C:drive). let it run and put the kids to bed...roughly 1 hour. came back and tried to run World of Warplanes. the XXXXXX have been changed to protect the name and all that . tried running World of warships and that worked fine. Sat in WOWS for a little bit exited. waited a bit and tried world of warplanes again and it worked... will try again tomorrow to see what if anything causes the issue. Closing WoWP does not kill the process and prevents it from being launched. I realize this is not a launcher bug per se but it affect the launcher's functionality. 1. I started WoWP from the launcher and played a few games. 3. I cannot start WoWP from the launcher again. 4. I had to kill the WoWP process to fix that. It probably affects the installation of the Launcher too if the WoWP process is wedged. Odd loading behavior has now gone away??? (see post #16). Everything is working normally again.